Why don’t you try again? This is the question my pottery teacher asked as my shoulders slumped in a posture of defeat. I looked down at the lump of clay I had been working on for close to 30 minutes. Its shape now indiscernible due to some mistake I had made, but could not identify. This wasn’t the first time I had met with failure either, in fact, it was probably the third or fourth time in the last hour! I had begun taking pottery classes a few weeks earlier and found a great deal of enjoyment in the craft, deciding to pursue some more advanced lessons. However, now I was doubting my decision and wondering if I would ever actually be able to create the beautiful and unique vessels I longed to design. I often slap a failure label on situations like this one. And I find myself assuming the same posture of defeat in other areas of life, but particularly in my relationship with God. I read verses like Matthew 5:48 that say things like, Be perfect, therefore, as your heavenly Father is perfect and my head hangs low in a posture of defeat. The call to become who God created me to be often sounds more like the hammering gavel of God's judgment announcing I haven't arrived yet at perfection. I see Gods methods of purification through the refining fire and see it either as discipline - or rejection of me. I get so hung up in what Im not doing well, or how I cannot see progress being made, because I want to be fully transformed NOW!! I'm beginning to notice, though, that perhaps I've been looking at these things through the wrong lens. What if the purpose of God's refining fire was really to draw the best and deepest parts of us to the surface instead? What if those are the parts of us that God created with love and intentionality, but they've been hidden over the years by wounds and walls. And what if that process takes time? I like to see immediate results, but it takes time for the fire to get hot enough to purify. You see, perfection isn't a goal to be reached somewhere in the distant future, but is actually this process of our transformation on the journey now. Our refining and purification isn't for the purpose of pointing out our impurities and failures; it is for the purpose of bringing glory to God. And what brings glory to God is the beauty of what He is producing in me while I am in process in the fire. When silver is finally removed from the fire, what draws your attention, the beauty of the silver or the impurities left behind in the fire? The silver, of course. Silver refined in the fire perfectly reflects the image of the refiner. Isaiah 48:10-11 says See, I have refined you, though not as silver; I have tested you in the furnace of affliction. For my own sake, for my own sake, I do this. God is drawing out the truest parts of me in the process of the journey enabling me to live from this place of truth. He knows that I'm not perfect yet! And He loves me just as much in process as He will love me later in my life when these struggles have faded away and others have risen to the surface. God's love is most evident in our journey of transformation. And that journey, while painful at times, is a journey designed to draw out God's overwhelming intentionality as a creator who calls us to perfection and patiently stays with us as we become more like Him. In fact, the journey is what He created us for, it is where we live out the Kingdom of God. I look forward to the day when a lump of clay will be formed and take shape in my hands as it becomes a useful and beautiful vessel. 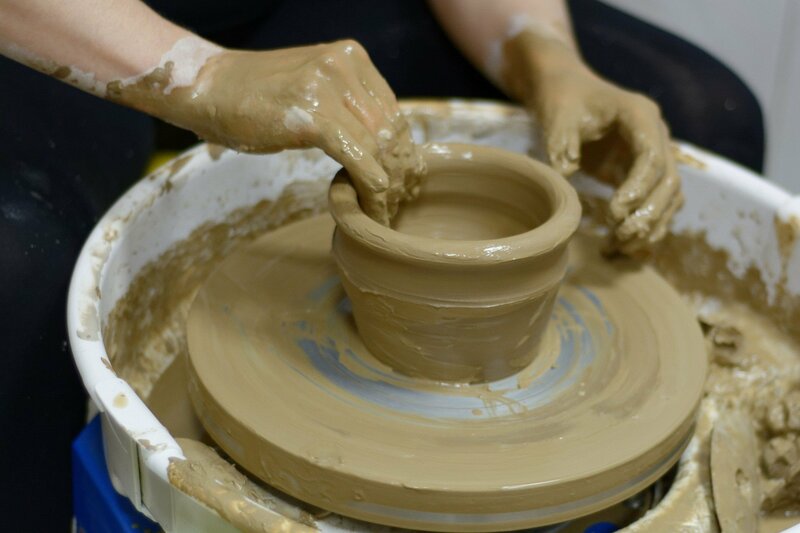 And, as I awkwardly learn the skill of working the clay, I can find enjoyment in still being in the stages of learning, patiently growing to develop a new skill. I can trust that,in process, God is not disappointed. On the contrary, His love overflows. We went through fire and water, but you brought us to a place of abundance (Psalm 66:12). Leah is an alumnus of Generation 26 of the Journey. She currently works at Discovery Ministries in Eminence, MO, a camp that specializes in using the wilderness and challenge to bring about spiritual transformation and awakening to the lives of students and adults. On her own journey, Leah has seen and experienced the hectic busyness of ministry that subtly draws her away from intimacy with God to want to do more for God instead. She is on a journey of seeking to enter God's rest and love and she desires to walk with others whose journeys follow similar paths. Yeah, Leah!! Thanks for again sharing your journey in transformation, what we all go through in life! I love your illustration of throwing a pot and wanting to be able to do it well NOW. I’m having a similar experience in taking watercolor painting classes. (I may have mentioned that before.) I too want to do it well NOW. But thank you for your words reminding me that that we don’t reach perfection instantly, but through process, just as he continues to refine us. So may we both be patient in the process and bring him glory by using new gifts we didn’t know we had! Instead of being frustrated in my this new learning process of painting, I want to do it for his glory! He will continue to refine us! It’s so good to read your writings. He has given you much talent in that area too, so keep writing to his glory! Yeah Leah! It’s so good to read your writing again. Thanks for sharing for transformation journey with your reference to throwing pots. I can so relate with my classes in watercolor painting! It’s great to discover a talent we didn’t know we had till we tried it. And now I want to do it for His glory for the way He created me, instead of being frustrated for not creating perfection instantly!